Hi Mary, you could sley 1,1,1,1,2 to get 18 EPI, I actually find it hard to get 18 PPI so I am weaving at 17 now, so would not go up. Hi all, I’m just now getting to sample 1 after working my way through all the wonderful content in season 1. All I have for my floor loom is a 15 dent reed, and according to the reed substitution chart, the closest I can get to the starting point of 18 epi is 19. Will this work okay, besides being slightly harder to beat to the same number of ppi? I’m not sure when I’ll be able to get another reed, so I’d like to just work with what I have if possible. I’m guessing I can open things up to 15 and then 11.5 to play around later in the warp. Thanks Jane! I’m now perfectly clear on how to proceed! Just waiting for my yarn to come. Can’t wait to get started, I love the draft! For this to work you will have to make 2 warps. 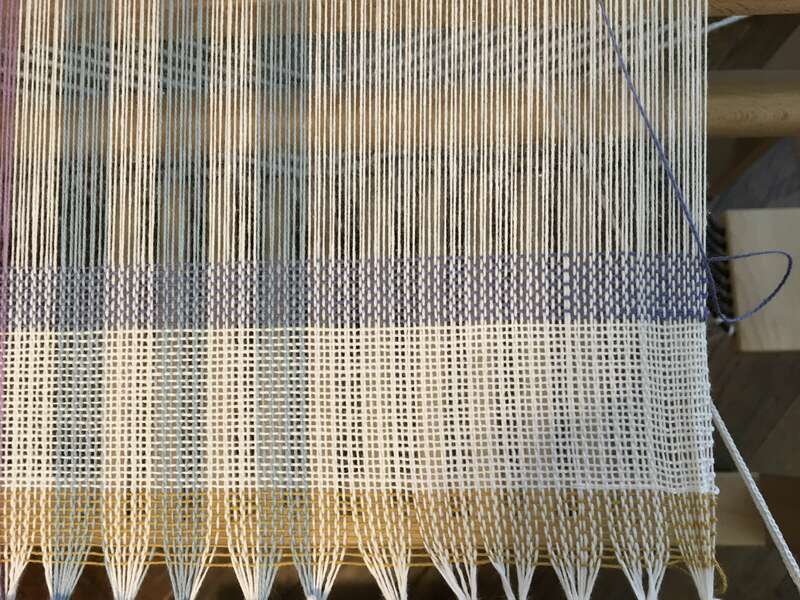 If you start by warping for the 12 ends per inch (24 epi) in actually threads, you will not have enough ends in your warp to go to the tighter epi of 18 and have any width. When I do the math at 15″ at 12 (24 x 15″ =360) wide in the reed you will only have 360 warp ends which divided by 36 epi is only 10″ wide. That is why you will need to do it in 2 warps. You are correct that you need to double your ends per inch and that one layer will one on 1 & 2 and the 2nd layer will be on 3 & 4. Just use your 12 dent reed for all of it. For the 24 epi it will be 2 per dent for the 36 epi it will be 3 per dent. Greetings to Jane and this question is for you or the hive mind. 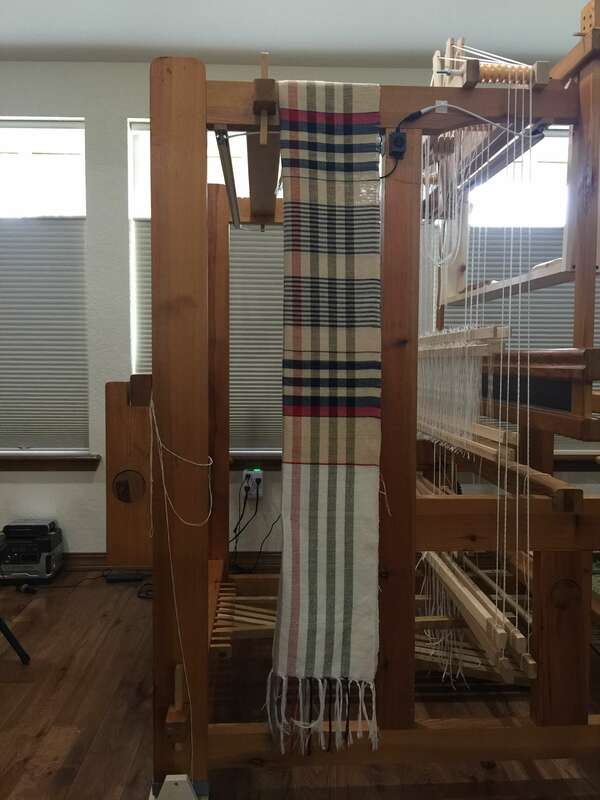 I’m a fairly new weaver and will be weaving on my 4-shaft Dorothy with a 15 3/4″ weaving width. This poses a width problem for me which I’ll have to overcome by weaving a double width cloth. I’ve never woven a double width before, though I believe I’ve figured out the threading and treading. I want to make sure I’m thinking correctly. Shafts 1 & 2 will be the top layer of my cloth and shafts 3 & 4 will be the bottom layer. It seems to me for a sett of 18, I need to wind warp for 36 epi, and use the heddles required for a sett of 36, to give me 18 epi on each layer. Do I have that right? My second concern is when we switch to 12 epi, once again my narrow width loom is a problem. So my second question is would you start by warping for 12 epi (24) then moving tighter to 18? I’d like to make all my samples as dish towels to finish at 26″ wide. Any and all help will be greatly appreciated!!! Another question – what size reed should I use? For 36 epi or 18 epi? This reply was modified 9 months ago by carol1855wlr. Hi Diana – have you jumped ahead and watched 2.6.2 Plaid at the Loom? Jane shows an easy way to do a 2 pick stripe. I need advice as to what happened on one side of my selvage, but not on the other when I was doing a 2 white 2 red repetitive sequence. I started them on different sides of the warp. Red from the left, white from the right. I am slowly working my way through the asymmetry sample and have spaced out the warp to 12 epi. I wove a 23.3″ x 70 ” Sample (hoping it can be a light shawl) The negative space looks square, it is 12 ppi. Now I am going to attempt using Harrisville Shetland for the weft. If I keep my little negatives space square – square…..I think I am closer to 11 ppi than 12. What problems will this present? I am going to carry on for a bit anyway but just wondered if anyone had tested this combination within this sample. My intention is to work on sett for Cotton (warp)/Wool (weft) throws. To all of you at JST I am learning so much through watching and sampling….and watching again. What a wonderful resource this is! This reply was modified 9 months, 3 weeks ago by Diana. 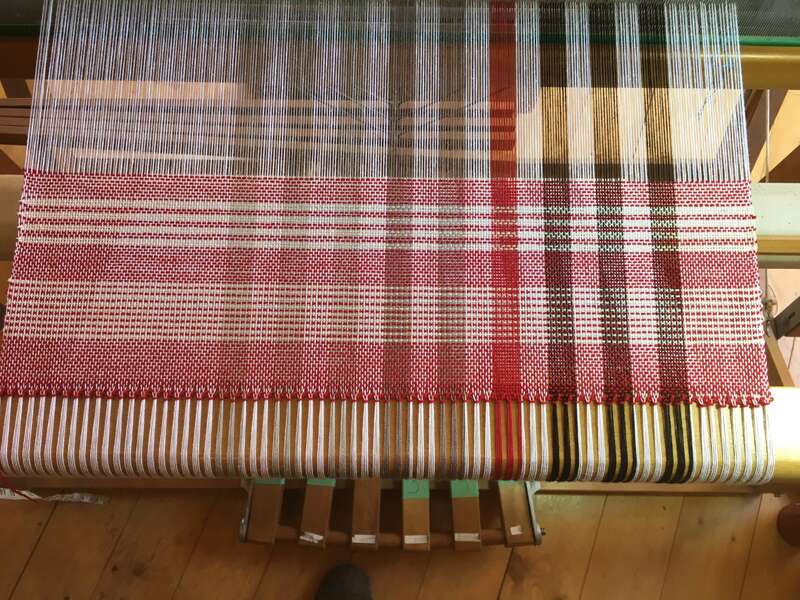 You can cut the one thread off and pull from the back and let it hang over the back beam as it looks like you’ve threaded both in the same harness, side by side, but I’m wondering how you threaded your reed and if it would leave a bit of a gap in your weaving. If you threaded something like 2,1,2,1…then it should be fine to just pull it out. 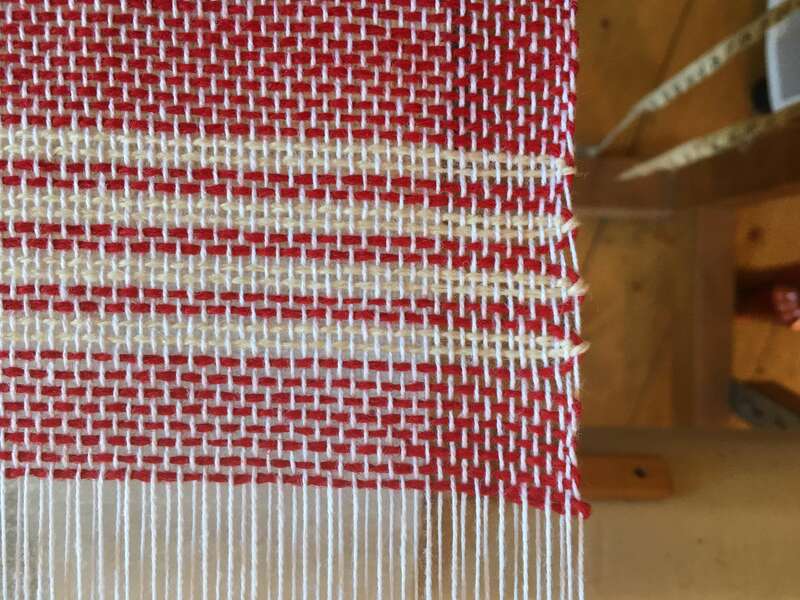 That said though, you are right at the beginning of your weaving and I would actually undo your weaving or cut off what you’ve woven and rethread the heddles & reed from the right of the mistake on. It won’t take you too long, it looks like only about 30 threads. Oh I like the blue you are using for your stripes! 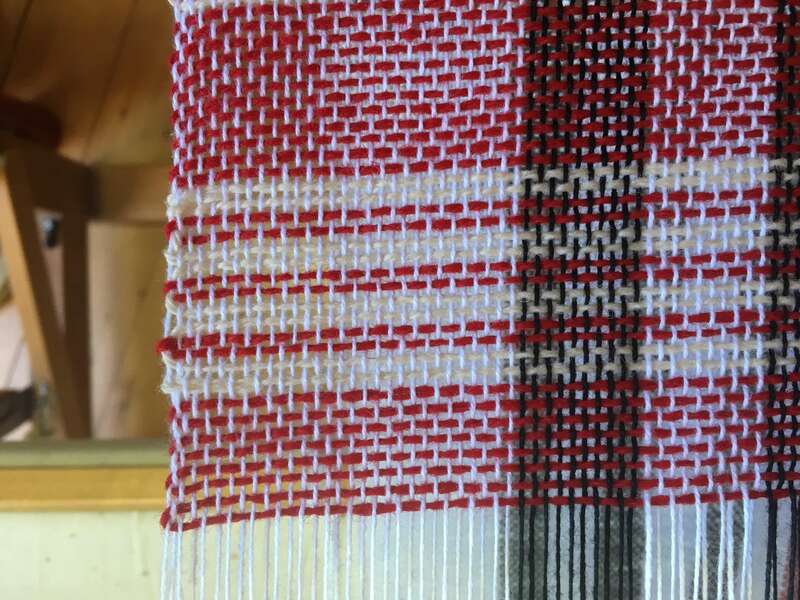 Welcome to the world of weaving! Hi! Brand new Weaver here, and I mean BRAND new. I’m working through the episodes and really learning a lot. So, I’m starting with Asymmetry and had to wind the warp twice as all I could do was cut off the first attempt. But I now have a good warp. Finished the tying on and started weaving and discovered a threading error. What I want to know is the best way to fix it without cutting it off and retreading the heddles. Jane you said black and navy go good together, so I tried it. Thought this would make an interesting scarf. I thought we were supposed to be measuring the squares under tension — was that incorrect? I wove 3 samples on my Asymmetry warp, cut them off, and finished them. Although I carefully wove to square, I found that the squares were rectangles (shorter than wide) after finishing. Beautiful blanket. Looks so soft and drapey. This reply was modified 11 months, 1 week ago by Betty.allen.